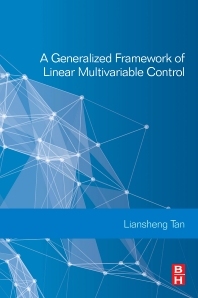 A Generalized Framework of Linear Multivariable Control proposes a number of generalized models by using the generalized inverse of matrix, while the usual linear multivariable control theory relies on some regular models. The book supports that in H-infinity control, the linear fractional transformation formulation is relying on the inverse of the block matrix. If the block matrix is not regular, the H-infinity control does not apply any more in the normal framework. Therefore, it is very important to relax those restrictions to generalize the classical notions and models to include some non-regular cases. This book is ideal for scholars, academics, professional engineer and students who are interested in control system theory. He received his PhD degree from Loughborough University in the UK in 1999. He was a research fellow in Research School of Information Sciences and Engineering, The Australian National University, Australia from 2006 til 2009, and a postdoctoral research fellow in 2001 in School of Information Technology and Engineering at University of Ottawa, Canada. He has also held a number of visiting research positions at Loughborough University, University of Tsukuba, City University of Hong Kong and University of Melbourne. He is currently Editor-in-Chief of Journal of Computers, an Editor of International Journal of Computer Networks and Communications. He was an Editor of Dynamics of Continuous, Discrete and Impulsive Systems (Series B: Applications and Algorithms) (2006-2008), and an Editor of International Journal of Communication Systems. He has published over 120 referred papers widely in international journals and conferences. He has been intensively worked on the subject of linear multivariable control theory since his PhD study at Loughborough University in the UK. His main contributions on this subject have been to generalize, extend and widen the scope of the linear multivariable control theory. Therefore, he has accumulated focuses on this very important and fundamental subject.